The Stonewater Development is a family centered community within the city limits of Cary, North Carolina. Cary is near North Carolina’s Research Triangle Park and adjacent to the city of Raleigh. The pleasant weather of Cary, North Carolina compliments the safe streets for bicycles and pedestrians. Cary is an award winning community for cycling enthusiasts. U.S. Bicycle Route 1 from Florida passes through suburban Cary as it makes it’s way as far north as the state of Maine. Throughout the town of Cary, sidewalks and paved trails connect neighborhoods and parks which give the entire community a pleasant park-like atmosphere. Cary is also an outstanding place for sports lovers. In addition to an abundance of college sports, Cary is home to the U.S.A. Baseball National Training Complex. Stonewater is part of the Wake County Public School System which is an award winning school district with very high academic ratings. There are also many private school situations available for k-12 students. Opportunities for higher education in Cary are plentiful. The three biggest Universities; University of North Carolina at Chapel Hill, Duke University and North Carolina State University are all very close to Cary. A variety of smaller private colleges are within an easy commuting distance. 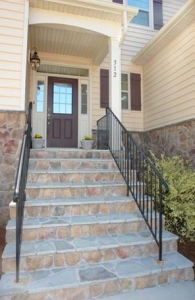 Stonewater is one of the city of Cary’s outstanding developments. Stonewater is a meticulously planned community that is secure, easy to live in and rich with diversity. Stonewater has risen from a brilliant master plan which guarantees physically attractive neighborhoods that are extremely easy to live in. The highest quality of architectural design has been used to guarantee lasting beauty and value. In Stonewater, there are a wide variety of high quality homes and price ranges starting at $200,000 for deluxe town homes in friendly and walkable communities. Architecturally appealing detached homes with stacked stone, traditional design and natural colors create a comfortable and established feeling to neighborhood streets. Detached homes are priced as low as $300,000. Walking to Stonewater pool is a safe and pleasurable activity with lovely walking trails and paths connecting homes to the community center. The neighborhood community center is equipped with a junior Olympic sized pool and tot lot. The walking paths will lead residents to a planned community park one day very soon in addition to a proposed village shopping center. Stonewater is located just minutes from I-540 and Hwy 55 and only 2 miles from Research Triangle Park. The City of Cary is committed to high quality public transportation in order to serve its citizens and currently operates 6 routes. For passengers over the age of 60, door step pickup is available. There are many miles of bike paths both on and off public streets for those who prefer cycling as a transportation mode.